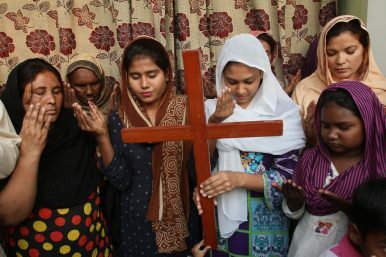 Pakistan Christians pray for Asia Bibi, a Catholic mother of five who has been on death row since 2010 accused of blasphemy in Multan, Pakistan. An altercation between a Christian woman and Muslim women was based on a Hindu custom. Customs and habits cannot be partitioned. Neither can they be easily cleansed through conversion. In 2009 Aasia Bibi, an inhabitant of a Pakistani village, while taking a break from work drank water from a vessel standing on the rim of a well. As it turned out, the pot belonged to local Muslim women. In an argument that followed Bibi allegedly said something objectionable about the prophet Muhammad. She was subsequently assaulted, first by the village women, then by a larger mob, and eventually arrested and sentenced to death. The legal basis of the verdict is country’s blasphemy law which mandates death or life imprisonment for those criticizing Islam or Muhammad. Bibi had been on death row and in prison since 2010, leaving her husband and children on their own, until the Supreme Court of Pakistan overturned the earlier sentence. I am not planning, to cover the religious, legal or political aspects of the 9-year old Aasia Bibi case. Two texts for The Diplomat referred to these issues: This story’s connection to Pakistan’s controversial blasphemy law has been covered by Umair Jamal, while the initial fallout from the recent verdict had been described by Daud Khattak. I would like to focus on another aspect. Let us rewind to 2009. The altercation between Aasia Bibi and the women from her village started when she touched their pot. Yes, she is a Christian and they were Muslims. But the taboo of impurity that divided them is most common in Hindu traditions. At the risk of stating the obvious, Pakistan had been a part of India before 1947. Some of Pakistan’s and India’s Muslims are descendants of followers of Islam that had been coming to South Asia for centuries. Some would have been of mixed pedigree but probably most of them are the progeny of Indians that had converted to Islam. A person’s mind is not cleansed of all previous beliefs, customs and habits during the conversion, and a new religion is not imprinted on the mind as if on a clean slab. Thousands of fascinating accounts from different times and places show how converts often carried over elements of their thinking, their old beliefs and customs to a new religion. In some cases, one could convert to Islam or Christianity from Hinduism to avoid the rigid hierarchy of the caste system (or for other reasons, sometimes voluntarily and sometimes forced), hoping for a greater equality in the new community. But this personal choice did not automatically mean that other members of the community stopped regarding the convert as a member of a caste. Although both Islam and Christianity in theory hold up equality, there are elements of hierarchy in many of their communities. In South Asia, both religions reject the caste system, but in fact have swallowed up its elements and customs in lesser or larger degrees. Some Christian communities in India, for example, do not let low castes enter deeper into the church, while other communities reject this rule. Intercaste marriages between Indian Christians are also not that common as an idealist would have expected, and there are cases of separate graveyard sections for Christian Dalits (untouchables). It is a separate debate how much the caste system was only a South Asian phenomenon. In its most orthodox form, it may be found only in that region but rules of hierarchy, segregation and ostracism exist in various ways across time and space. It is possible that the plight of certain communities is a fossilized and mixed form of more than one hierarchy. Long ago, commoners in Poland were expected to stay in the vestibule and the side aisles of the church during Mass, a custom admittedly not that different from the caste customs of some Indian Christians, though without the impurity taboo. And it is not that different in Pakistan. Aasia Bibi’s Christian community is still treated like an untouchable caste by many Pakistani Muslims. Untouchables are called so because other castes regard physical contact with them as polluting. Many of Pakistan’s current (and earlier India’s) Hindu untouchables had earlier converted to either Christianity or Islam; some also later converted again from Christianity to Islam. Yet they are still perceived as impure by other Muslims, though the latter claim they do not believe in either castes or impurity. Much like the Dalits in India, who are ostracized by higher castes, the Pakistani Christian untouchables are expected not to touch the food or the utensils of Muslims. Some Pakistani restaurant owners keep separate utensils, often old and damaged ones, for Christians. Some Pakistanis give their leftover food to untouchable garbage collectors, a custom that reminds us of old, orthodox Hindu traditions. These rules were transgressed when the Muslim village women’s pot was touched by Aasia Bibi. Her sorrowful story is a symbol of not only the intolerant blasphemy laws but the woes of its religious minorities. At least four inequalities merged in Aasia Bibi’s story: She is woman, a person from a rural area, a Christian and an untouchable. The last two, unfortunately, are often merged into one notion in Pakistan’s social reality. Bibi's hiding place is comfortable enough, but it's still a jail of sorts.